Horseriding makes for a very special way of not only seeing the beauty of the Daintree Rainforest, but also the sense of enjoyment derived from both the freedom of riding and feeling connected with the great outdoors. 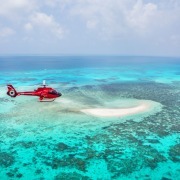 Options are availble to explore two unique environments with Cape Trib Horserides or Giddy Up Horseriding. 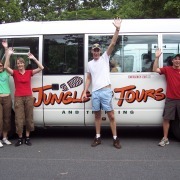 Both tours explore different areas of the Daintree Rainforest. The best way to truly appreciate the oldest rainforest in the world is to stay a night. If you're travelling on your own or don't want to hire a car, then take a fully guided organised tour. 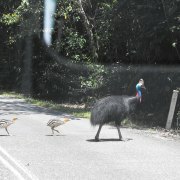 Your friendly tour guide will share all there is to know about the Daintree Rainforest including its surrounds. Itineraries have been designed to include the best and most interesting highlights of the region, to maximise your rainforest experience. There are also a number of adventure activities that you can also incorporate into your stay, including Jungle Surfing, Horseriding or an exciting Night Walk. Accommodation in the packages is varied, ranging from budget style dorm accommodation to a free-standing private cabin. 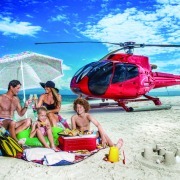 Packages can be arranged for the whole family. The Daintree Rainforest is the oldest, continuously surviving rainforest containing the greatest diversity of plants and animals found anywhere in Australia. Covering an expanse of more than 1,200 sq km, the landscape is diverse and the coastal scenery extremely rare; combining tropical rainforest, white sandy beaches and fringing reefs just offshore. This special area is the only place on earth where two heritage listed areas meet side by side - the reef and the rainforest. With magnificent scenery, mountain ranges, fast flowing streams and waterfalls, deep gorges and dense rainforest, it is a sight not to missed on your holiday itinerary. 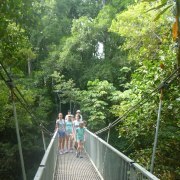 Take a look at our extensive collection of rainforest tours and activities. Exploring the rainforest doesn't have to be through the window of a vehicle or guided walking trails. 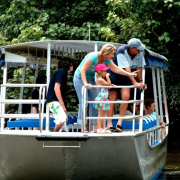 There are many non-traditional ways to view the rainforest in the Daintree, which will give you a closer inspection of the wildlife, flora and fauna in the region, from the forest floor to the canopy above. Sea kayaking is a great opportunity to explore up close the tropical beaches, fringing reef, mangroves and marine wildlife. 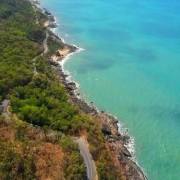 Enjoy spectacular views of the Daintree National Park as the rainforest clad mountains sweep down to the ocean. There is so much to discover out on the water but the most exciting is spotting marine wildlife. Every day is different with wildlife frequently spotted including sea turtles, schools of fish, sea eagles, dolphins, dugong, sting rays and the occasional whale passing during migration season (July and August). 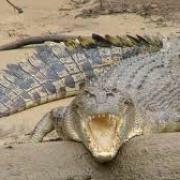 A visit to the Daintree is a magical experience where you can view some of the most ancient, rare, primitive and endemic species in all thier natural glory. The Wet Tropics World Heritage Region contains Australia’s greatest diversity of animals and plants within an area of just 0.26% of the continent. It is home to: 26% of Australia's frogs, 17% of it's reptiles, 58% of it's butterflies, 30% of marsupial species and 48% of it's birds, many of which are endemic to this eco system only. Most of the world's 19 primitive plant families are found in Daintree National Park and the surrounding area. Take a look at some of these exciting touring options where you can truly marvel at the significance of this outstanding World Heritage Region.